Photo from the Joint Broadcast frpm Ocala FL…Great time there! 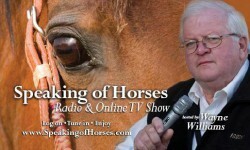 The Speaking of Horses Show, brings you the world of horses, from the professionals of the industry. This radio and video show brings you interviews with professionals, celebrities, and people just like you, who have a love of horses. You will find that Speaking of Horses will bring you into the world of horse expos, horse fairs, and celebrations. Check out the Speaking of Horses website to sit back and enjoy all the interviews and exciting things that Speaking of Horses will bring to you. Speaking of Horses was a concept of bringing you the very best in horse entertainment whether being audio or video via the world wide web. Wayne Williams is your host of “Speaking of Horses”, he has over 40 years of horse experience and over 35 years in radio background to add to the program. Wayne is the “Voice” of many horse expos and fairs across the United States and has all the tools to create the ultimate audio/video show based on horses. 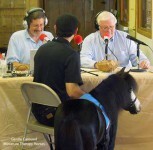 The Speaking of Horses Show! Check out our website for upcoming events and come by to see us.